Global Teacher Prize: Meet Peter Tabichi - the world's best teacher! Say "Hello, sir" to the world's greatest teacher! Or maybe you would say "Hello, Brother Peter." 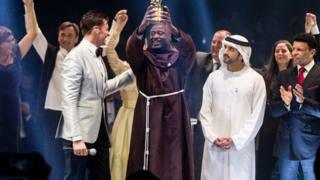 Brother Peter Tabichi, who is a a member of the Franciscan religious order, was crowned the winner of the Global Teacher Prize given out by the Varkey Foundation. He was given the award by the Greatest Showman himself, Hugh Jackman. It comes with a prize of $1million (around £758,000) but it might not make Brother Peter rich, as he gives 80 per cent of his monthly income away. Does your teacher have skills like this guy? UK teacher is the world's best! Peter is a maths and physics teacher from Kenya and teaches in a secondary school in a village in Africa's Rift Valley. The Keriko Mixed Day Secondary School in Pwani village is in a remote area where drought and famine are frequent. Around 95 per cent of the school's pupils come from "poor families, almost a third are orphans or have only one parent, and many go without food at home," according to the people in charge of giving out the prize. Mr Tabichi has been teaching for 12 years. He expanded the school's science club, helping pupils design research projects of such quality that most now qualify for national competitions. Finalists were selected from more than 10,000 nominees and applications from 179 countries around the world. Other finalists included a teacher from the UK - Andrew Moffat from Parkfield Community School.